Do your clients find it difficult to finish the tasks that they have started? We're all guilty of putting things off occasionally, however when people repeatedly delay finishing a job then it can cause resentment and frustration in their relationships. Helping your clients to overcome their procrastination in completing the tasks they have started will give them a feeling of appreciation and satisfaction. 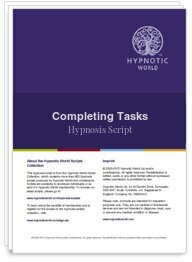 Download this Completing Tasks script today to give your clients the motivation they need.